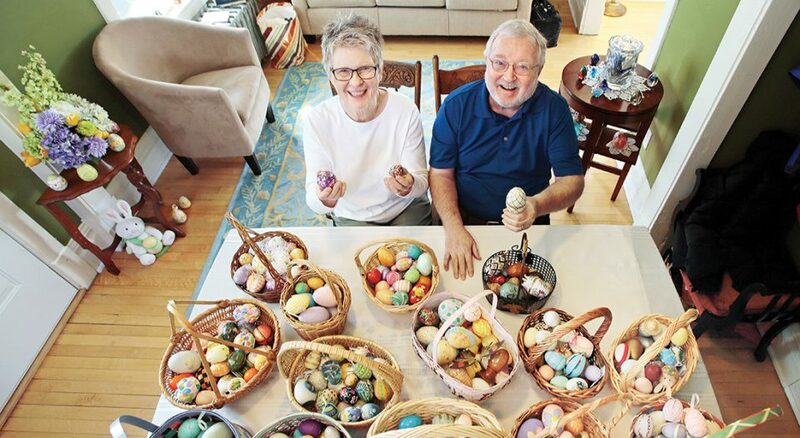 Marilyn and David Isaacson sit among his Easter egg collection in their home in Fargo, N.D. A retired ELCA pastor, David has been giving away eggs on Easter Sunday for 17 years. David Isaacson of Fargo, N.D., has an eye for eggs. Ceramic, stone, wooden, etched, paper, painted or plain, the retired pastor has been collecting and giving away eggs at Easter for 17 years. It started when he wanted to give a gift to the organist and secretary at his former church, Verona (N.D.) Lutheran. Today, Isaacson estimates he has given away 5,000 eggs over the last five years since he’s been keeping track. This year, he has set aside 500 to give to worshipers after Easter services at Pontoppidan Lutheran Church in Fargo, where he and his wife Marilyn are members. “On Easter everyone is invited to take an egg from one of the many baskets I will set up,” he said, adding that another 70 will go to members of the Kiwanis Club of Fargo and 30 to family and friends. Collecting eggs is an enjoyable quest for Isaacson, who visits thrift shops, yard sales, discount stores and anywhere else he thinks he might come across one that is nicely shaped or decorated. Some cost just cents, while his most expensive egg is crystal and cost $44. And it warms his heart to receive eggs from parishioners at his former congregations in Maine, New York and North Dakota. With Easter approaching, Isaacson will soon find his collection depleted. But he’s already on the lookout for next year’s eggs. “Once Valentine’s Day is over, the stores [start] bringing out the eggs,” he said. Annemarie Mannion is a freelance writer who enjoys writing about people, the challenges they face and how they overcome them.